Mounted on a base/header for direct mount to PCB. 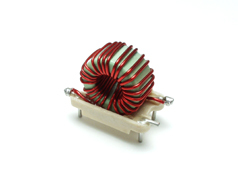 MINIMUM INDUCTANCE SHOWN ARE AT RATED CURRENT. 1 = Type 1, see X and Y dim. 2) The dimensions shown below (in mm) are for Height x Length x Width. Please click on "Dimensions Specifications" icon above to see details of the 'X' and 'Y' dimension as shown in the foot print drawing, and the lead diameter.